Would you like to know Facts about fleas, ticks and lice? PUPAE: Larvae spin cocoons and grow into adult fleas. They hatch when they sense warmth, C02 and vibrations. 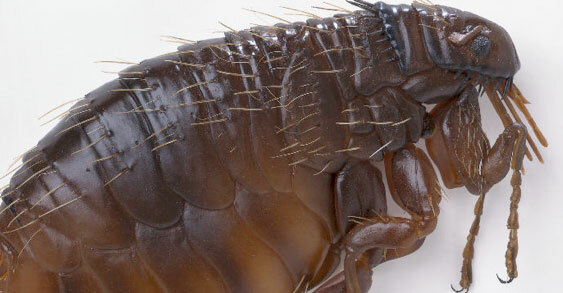 ADULT FLEAS: Adult fleas live on your cat and females lay up to 50 eggs per day. FLEA EGGS: Eggs fall off of your cat everywhere it goes. On the carpet, sofa, car and bed. LARVAE: Eggs hatch into larvae which move away from light, deep into carpets or furnishings. BACK TO STEP 1 to continue the flea infestation cycle. Only 5% of the flea infestation problem will be on your cat. The remainder will be in your home. Give your cat a flea treatment such as Frontline, Advokat or a flea bath by a professional cat groomer. Spray your home with a flea treatment and use on all bedding, carpets and furniture. Your local council will also provide a service for professionals to visit your home to spray all areas. Please ring them to check. This must be done in conjunction with your cats treatment. Doing one of the above is never enough. Wash your cats bedding on a regular basis and hoover your home too on a regular basis. This is to ensure you remove any eggs, larvae and pupae. Make sure your cat receives a flea control treatment every 4 weeks. Front line or Advokat are recommended. For the several hours following application of a flea and tick preventive product, keep an eye on your cat for any reactions or sensitivity to the product. This is especially important when using a flea and tick product for the first time. Keep the packaging for the product for at least a day after application so that you have information as to the kind of ingredients used, as well as contact information for the company that manufactured the product. If you notice any unusual behavior shortly after applying a preventive product, call your veterinarian immediately. Bathe your cat completely in soapy water and rinse its coat with copious amounts of water. Ticks feed off of your cat by sucking its blood and can also transmit infectious diseases to humans and animals. They are likely to be found in heaths , moors and woods although they can also be found in gardens too. Use a treatment to kill Ticks which will usually take effect within 48 hours in which time the tick will fall off. Failing this use a tick remover, which looks a little like a pair of tweezers, to pull the tick out. Make sure you get the whole tick out or you will only remove the body and leave the head and pinchers in. Never leave ticks attached to your cat. Lice cause irritation and discomfort to your cat and it is recommended you contact your vet for treatment. Within 48 hours the lice will be dead. We hope the Facts about fleas, ticks and lice has helped you.